Many people will tell you to ice a sprained ankle, because that has been around for decades. However, just because ice is effective as a short term pain reliever does not mean it helps heal an injury. Surprisingly, the studies clearly show that ice is NOT effective at healing a sprained ankle. In fact, ice has actually been shown to slow down or even STOP the body’s natural healing process (immune response and removal of swelling and waste from the injury). That is why the National Athletics Trainers Association have just come out and stated ice is completely ineffective at healing an ankle sprain. In addition, prolonged rest will not help you rehabilitate your ankle back to full health. The reason for this is that a sprained ankle becomes very weak and unstable after a sprain. It is absolutely critical that you rebuild ankle strength, stability and range of motion for a full recovery. There are 3 Main Steps you need to follow in any good rehab program and without them, the body cannot heal properly. If you understand and follow these 3 steps, the body will heal at a much faster pace and also allow you to heal completely, which dramatically lowers your risk of future injury. Physical therapy is a great option if the therapist is knowledgeable about the latest research and understands the best healing techniques for your ankle. The only problem is that even if they are great, it can be a very expensive option. The H.E.M. 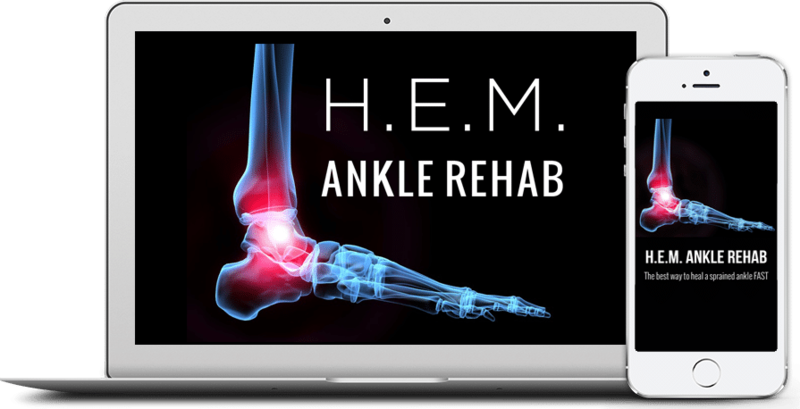 Ankle Rehab System was specifically designed to be the best and most affordable option for healing a sprained ankle fully and fast. Anyone can follow along at home in 3 easy steps without any equipment. H.E.M. 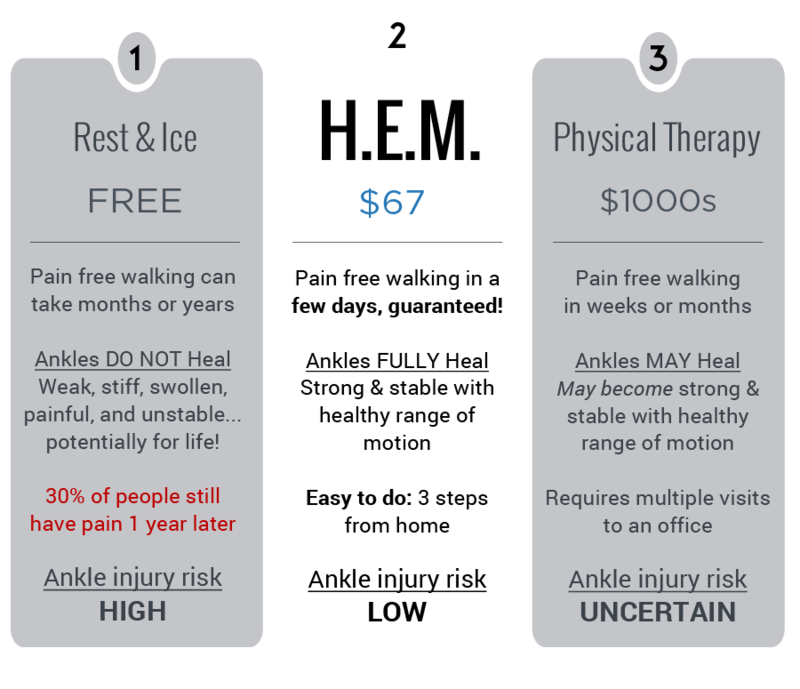 has helped over 50,000 people (and counting) of all ages and walks of life quickly and fully heal a sprained ankle and we guarantee you will get the same results or we will refund 100% of your money, no questions asked.